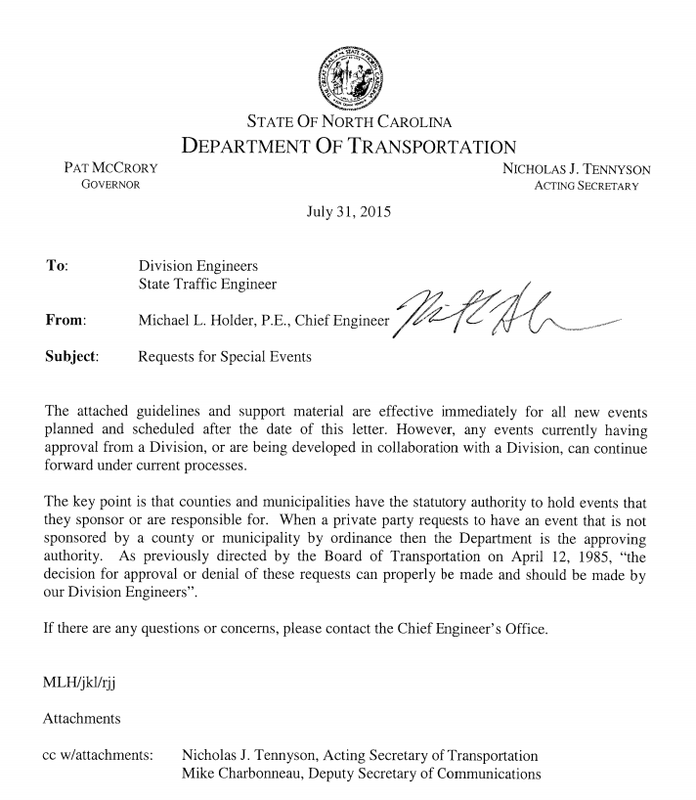 NCDOT has provided new instructions and guidelines for special events involving state highways. 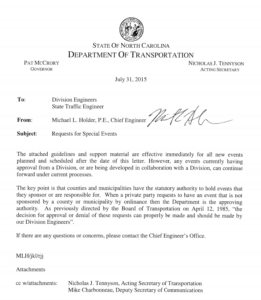 Last year, some confusion arose when NCDOT division engineers told group ride organizers that a special event request form must be submitted for virtually any group bike ride. The new special event form and guidelines make it clear that it only applies to events such as races and parades that involve road closure or other “repurposing” of the highway that makes it unavailable for transportation. A non-government sponsored road rally is planned to ride bicycles between New Bern and Morehead City. The special events form is not required because the ride is not changing the use of the highway and the expectation is that the riders will follow the rules of the road and obey all traffic control devices. However, if there is an expectation that the event would re-purpose or close any part of the highway, including shoulders, then the form would be required. An example of re-purposing the highway would be to have hydration stations on the shoulder at regular intervals to provide water and sports drinks to the riders. The cover letter sent to Division engineers may be read here. The official NCDOT Special Events site can be found here. Some special group rides, such as the Tour de Fat, involve road closures so that bicyclists can travel in a parade-like manner without concern about motor traffic, traffic signals or the normal rules of the road. Such road-closure rides should submit a Special Event Request to NCDOT (unless the local municipality is sponsoring and organizing the event). But most group rides involve open roads on which cyclists follow the normal rules of the road, and wouldn’t require the Special Events Request. An NCDOT highway engineer once asked BikeWalk NC if a significant number of bicyclists riding down the road wasn’t a “repurposing” of the road for something other than its intended use. This illustrates the effect of one’s belief system on the interpretation of regulations. If one believes that the purpose of roads is to move cars, then road bicycling may seem like a repurposing. But if one believes, as we do, that the purpose of roads is to move people, then a road carrying lots of bicyclists would seem to be serving its intended purpose quite wonderfully. Note that BikeWalk NC encourages bike clubs and other organizations to work with local authorities and police departments when organizing large group rides that may require traffic control. Local permits may also be required for accommodations of large crowds at event start and stop locations.